Perfect watch to hang on my purse. The time is really large so I can see it without my glasses. I love it. 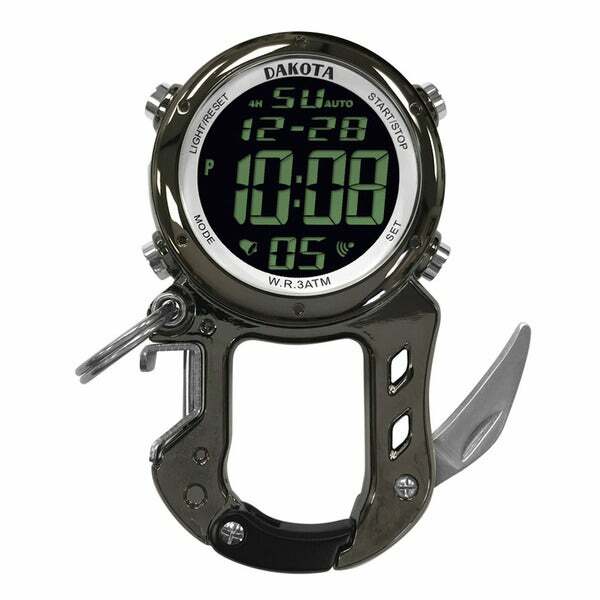 The Digital Zip Clip by Dakota is the ultimate multi-tool clip watch carabiner. Digital features include a stopwatch, alarm, countdown timer and day/date display. The case has an integrated bottle opener and fold out knife. The dial lights up in the dark with the moonglow EL light and is 100 feet water resistant. Bought this for my father in law, whose skin is getting too thin for a wristwatch. He loves it. Keeps his keys on it, as well. And the digital dial is big enough for him to read without needing glasses. I ordered this watch for my husband for Christmas and he loves the product. Tell time without looking at wrist watch.